MOSCOW, Idaho – Offensive line play just fundamentally looks right when it is working. Apply force, move a resisting object. Jump out at the correct angle and cut off an object heading toward the backfield. It is easy to see and appreciate. It is not so elegant when the resisting object is resisting too strenuously or is too quick to cut off. This is the aggravating situation the Idaho Vandals’ line found itself in Friday. Whether he is correct could have a significant bearing on how well the Vandals do in their first season back in the Big Sky Conference after 22 years in the Football Bowl Subdivision. 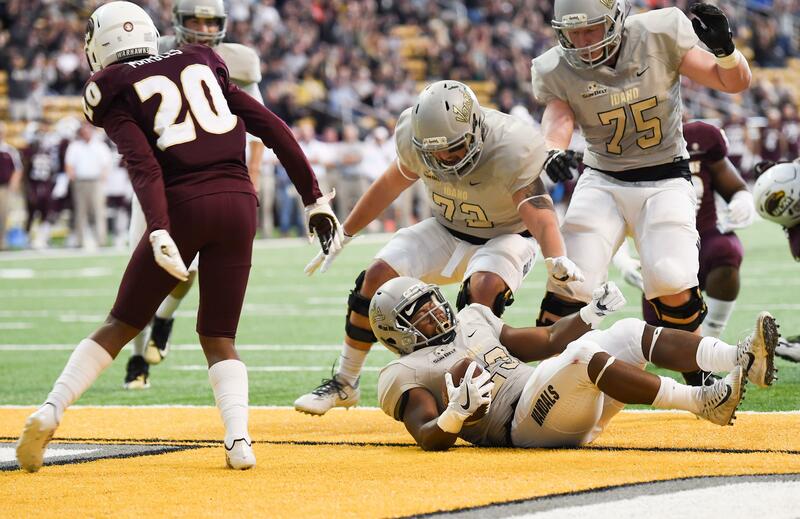 Last year, when Idaho was still playing in the FBS and the Sun Belt Conference, its young line too frequently looked like it did Friday, dominated distressingly often by strong, mature defenses. “I knew in games I was a small guy. My side of the line was 250, 260 pounds,” said Sean Tulette, who started at quick tackle last season. Tulette is playing at quick tackle and center this year. He is listed at 270 pounds on the preseason roster, and his challenge of staying somewhere near that weight with his increased workload will be easy to track. Fall below a certain poundage, and he wears the No. 72 he wore last year. Maintain his weight, and he gets to wear the No. 52 of NFL Hall of Fame linebacker Ray Lewis, Cinkovich said. The Vandals are looking good enough in the preseason that Cinkovich thinks they might rotate eight players regularly in the line, although the immediate goal is to identify the starting five. One of those will certainly be Noah Johnson, the 6-4, 300-pound junior guard who was named to the Phil Steele’s preseason All-America team and the preseason All-Big Sky Conference team. The honors were a pleasant surprise, said Johnson, who is still being eased back into a full practice schedule after undergoing surgery on both shoulders last year. “My main goal is to still be on the list at the end of the season,” Johnson said. For now, Johnson watches the guards from the sidelines and coaches the younger linemen during much of an Idaho practice. It helps keep him focused and thinking about proper line technique. But he is eager to return full time to prepare for Idaho’s opening game against Fresno State on Sept. 1. He predicts the Vandals’ line will be improved. The zone blocking will show more movement with bigger, quicker players inside, and the edge will be stouter. Tulette and last year’s starter, Conner Vrba, a 6-1, 304-pound sophomore from Meridian, Idaho, are splitting time at center. Tulette approached coaches over the winter about playing there, in the belief his quickness could add athleticism to the position. Making the blocking calls as a center was initially a challenge, Tulette said, but he feels he has mastered it. “He does a good job. He’s got good quickness and technique,” Cinkovich said. As a smaller lineman, Tulette said he lives on good technique and knowing his assignments and being able to play instinctively without having to think about them. While the engine of the Vandals’ offense might have been lugging Friday, the overall arc of its improvement is upward, Cinkovich, Johnson and Tulette said. “We’re bigger this year, for real,” Tulette said. A dominant offensive line not only helps Idaho but is its own reward. Good line play just stands out. Published: Aug. 17, 2018, 6:12 p.m.